Wales coach Warren Gatland and captain Ryan Jones have unveiled the debut kit from the WRU’s new official supplier, Under Armour. The nation’s new look for the coming season features ‘dragon scale grippy’ technology and highlights key national symbols such as the Welsh flag. The brand’s first international-level rugby kit is engineered with lighter and more breathable fabrics to improve comfort and range of movement to help enhance on-field performance. Inspired by the history and culture of Wales, the American-based performance apparel brand created a range of kit rooted in Welsh tradition. 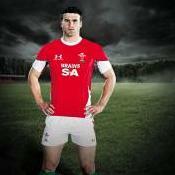 ‘Welsh red’ is the predominant colour for the tight-fitting home jersey, and the Welsh flag is stitched onto the jersey underneath the Welsh word ‘calon’ - meaning heart - on the inside back-neck of the collar. Additional details include ‘dragon scale grippy’ technology for enhanced ball-handling ability, triple seaming construction for maximum durability, ‘shammy’ textile inserts on shorts for improved handling in wet conditions and position-specific fit for the players. The new kit has undergone rigorous wear testing at national team training sessions and Gatland’s squad has played a pivotal role in fine-tuning the gear to ensure it meets their needs.